In order to advance the Magento 2 store layered navigation as well as to bring the best shopping experience to the visitors, Mageplaza developed the Layered Navigation Ultimate extension. This Ultimate version is the advanced version of the Pro version with many powerful and extra features will surely adapt any user’s expectation and plays an important role to build a successful store. 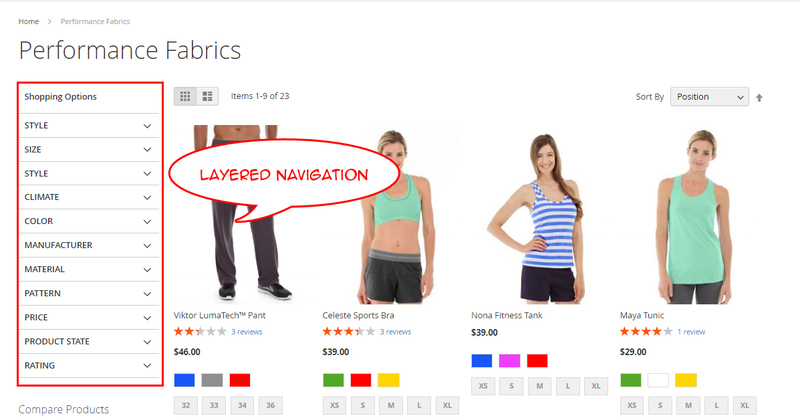 This Layered Navigation extension is a smart map for your Magento 2 store. It’s the shortest way for the shoppers to find what they want, especially when you have a bunch of items with various prices, attributes or brands. After enabling the module, the Layered Navigation will be displayed on the left sidebar on Categories pages. The Configuration is available under Admin Panel > Mageplaza > Layered Navigation > Configuration . Here are the details for the settings of each tab. In the Module Enable field: You can choose to use the Module Layered Navigation or not. Leave as Yes to enable and No to disable. By enabling this feature, the shoppers are allowed to choose more than 1 filter to find the desired items. You can also filter by multi-choose from multiple categories at the same time. For example: The shopper can choose to filter by Color with Black, White and Size with Small, Large at the same time. This can be also applied with multiple categories. 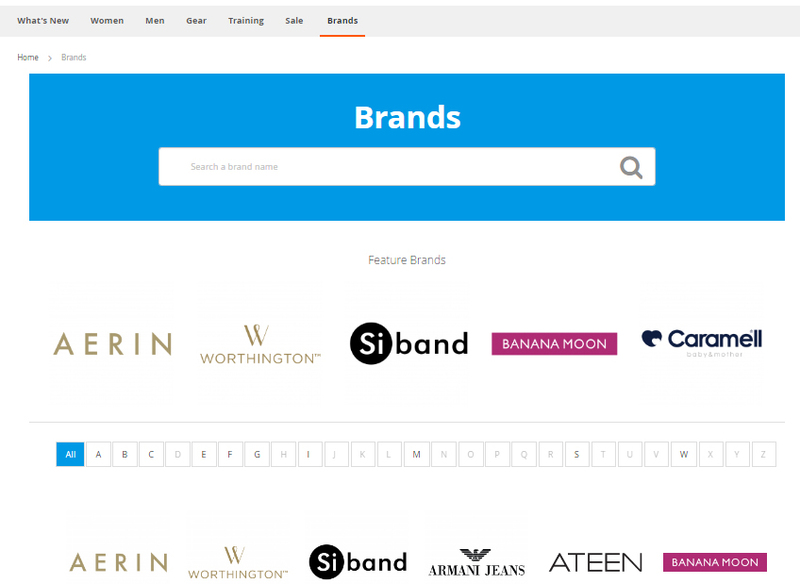 This feature allows the shoppers, after filtering, can automatically back to the top of the products list and start to find the desired items. YES : After choosing a filter or click on the Apply Filter button, the site will automatically scroll up to the top-page. NO : After choosing a filter or click on the Apply Filter button, the site still stay at the current position. By enabling this feature, in each of the attribute group, there is a search box. The shoppers only need to insert the letters and the filter whose name contains this letter will be displayed. Go to Enable Filter options field to “Enable/ Disable” this feature by setting “Yes/ No”. Yes: Show all the attributes and options even the product is currently out of stock. No: Hide all the attributes and options of the product which is currently out of stock. In the Product Count field: With this feature, there will have a number which is displayed next to the filter. This number allows the shoppers to know how many items which is matched the filter. For example: If the filter is displayed: Cotton(2), that means there are 2 items which are matched the filter Cotton. Set Yes to display the number to the left of the filter name. Set No to hide this number. Yes : The attribute group will already be expanded when the shoppers go to the Categories page. No : The shoppers need to click on the attribute group name to expand the filters. The Apply Filter button allows the shoppers to choose when to apply the chosen filters. With this button, the shoppers don’t need to wait for the page to reload again and again each time they choose a filter. In Add Apply Filter button field, set “Yes” to show the button and leave “No” to disable. Here is how the Apply Filter button works, you can choose lots of attribute before applying it. Also, SEO friendly URL is compatible with Apply Filter’s search result. As you can the this example chose Insulated and Cold, and name of those attributes appears on the URL as well. Continue with the next session. Infinite Scroll, or also called the Lazy-scrolling on a website, this feature will help to automatically load the new products in the list when the shoppers scroll to the bottom, without clicking or reloading. In the field Infinite scroll, set “Yes” to enable the feature and “No” to disable. By default, the Vertical & Horizontal Navigation feature has 3 display styles so `Mageplaza Layered Navigation`_() can match to any store design with different purposes. Expand by default: Choose Yes to automatically expand the group attribute Rating when shoppers go to the collection page. Enable New Filter, Enable On Sales filter, Enable Stock filter: Choose Yes to enable the filter and leave No to disable. 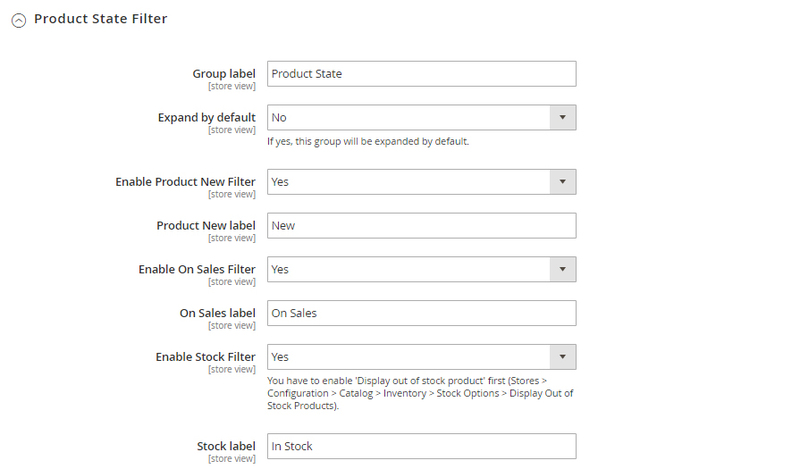 New label, On Sales label, Stock label: Add the name for each label filter. 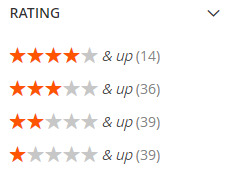 This feature allows the shoppers can filter the items by the rating follows 5 levels from 1 star to 5 stars. For example: when you choose the option 4 stars and up, the received result will display the items which have the 4-star and 5-star rating. The Rating Filter configuration is available under the Filter Configuration tab. In the Group Label : Adding the text as the group attribute’s name. In the Expand by default : Choose “Yes” to automatically expand the group attribute Rating when shoppers go to the collection page. Note: To make the config on Design Configuration tab works, please make sure you have set the Display type on the Attribute Configuration > Color to be Slider. By enabling Custom products page feature, all of your items will be displayed in only 1 pages with the advanced filtering. That allows the shoppers don’t need to find the exact categories page to filter the desired items. Besides, Mageplaza also provides the SEO config to improve the page’s ranking on the search engine result pages. 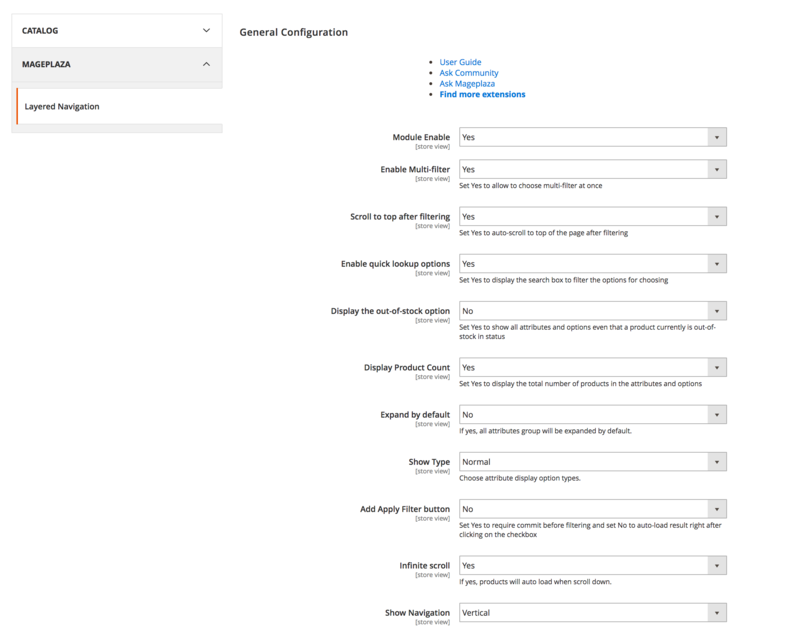 The Custom products page configuration is available under Admin Panel > Mageplaza > Layered Navigation: Custom Products Pages. Choose a product page to edit. In the Name field: Enter the name of the custom page in the backend. In the Page Title field: Enter the name of the custom page in the frontend. In the Status field: You can enable/disable the custom product page. In the Link Position field: choose the position of the link. In the Meta title field: Enter the meta tittle for the custom product page. In the Meta keywords field: Enter the meta keyword for the custom product page. In the Meta description field: Enter the meta descripton for the custom product page. Default Attributes allows you set the default attribute for the all products page. That means when the shoppers open the all products page, you can decide which products will be displayed first. 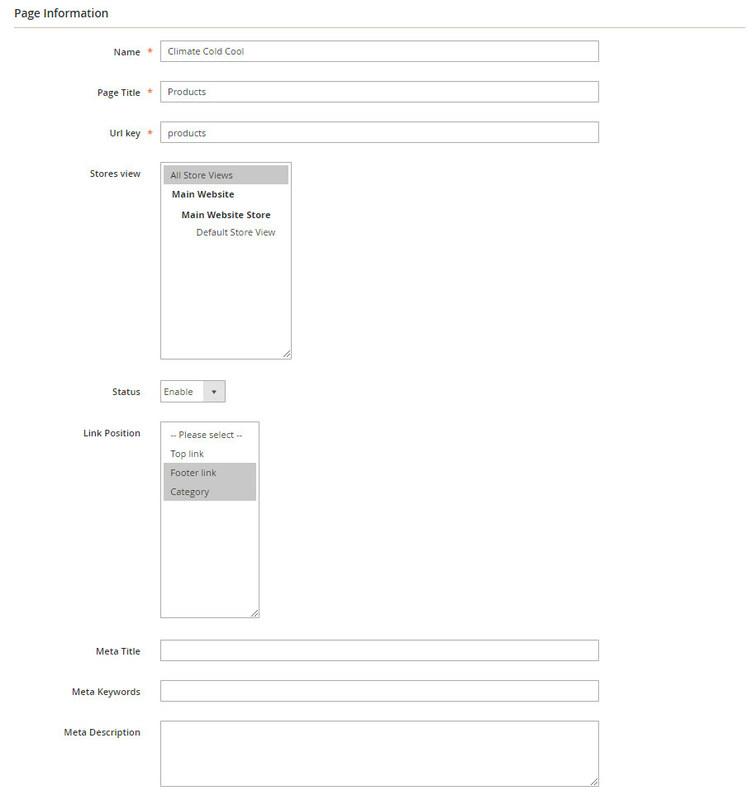 Go to Admin Panel > Stores > Attributes: Product, then choose an attribute and go to Layered Navigation Properties tab. In the Use in Search Results ProductsPage Navigation field: Choose the possibility of being filtered by Layered Navigation or not. In the Position field: The attribute has bigger posistion will be placed lower. 0 to set it in default as Magento 2’s principle. In the Allow Multiple Filter field: By choose Yes, the shoppers are able to filter by multi-option in this group attribute. For example: You can allow the shoppers to choose more than 1 filter in Color group attribute but only can choose 1 filter in Style group attribute. In the Display Style field: Choose the display style of the group attribute. The specific design for each style is mentioned in the next section. In the Enable search option field: Choose to enable/ disable the Quick Lookup Option in this attribute group. In the Expand by default field: Choose to automatically expand this attribute group or not when the shoppers go to the collection page. Layered Navigation also allows store owner can set up and visitor can filter decimal attributes. In the Attribute Information > Properties > Advanced Attribute Properties > Input Validation for Store Owner, choose Decimal Number or Intergal Number to set your optional attribute. Magento 2 Shop by Brand extension is also one of such great tool. Similar to the navigation, Shop by Brand allows filtering by product attributes, but they are neither color or material or any physical features of the product. The plugin bases on brands (manufacturers) the products are made by.